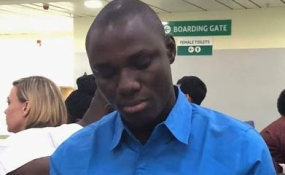 The Nigeria Police on Thursday publicly admitted they were detaining PREMIUM TIMES' journalist, Samuel Ogundipe over documents he used for a published story. The police did not say the story or documents use for it was false, but said they were determined to know how Mr Ogundipe had access to the "classified document." The spokesperson for the police, Jimoh Moshood, stated this during a protest at the Force Headquarters by various groups for the release of Mr Ogundipe who was arrested by the Special Anti-Robbery Squad on Tuesday. While addressing the protesters, Mr Moshood engaged in double speak. "We are not saying tell us the source of your story, we are saying tell us where the document emanates from," he said. The police have since his arrest on Tuesday been putting pressure on Mr Ogundipe to disclose his source for the story which revealed a report sent to Acting President Yemi Osinbajo by the Inspector-General of Police, Ibrahim Idris. In the report, the police chief indicted the former director general of the State Security Service, Lawal Daura, for last week's siege at the Senate. On Thursday, Mr Moshood accused Mr Ogundipe of "theft of classified documents" used in writing the story. He said Mr Ogundipe was arrested and arraigned in line with constitutional provision, insisting the police were committed to respect for the rule of law. Mr Ogundipe was arraigned on Wednesday at a Magistrate court in Kubwa. He was denied legal representation despite insisting he wanted one. Mr Moshood later on Thursday issued a statement after the protest. "It is factual to state that Mr. Samuel Ogundipe was arrested on the 14th of August, 2018 and on completion of preliminary Investigation, he was arraigned in a court of competent jurisdiction in the FCT in less than Twenty Four (24) Hours of his arrest. He was remanded to Police custody and the case was adjourned to Monday, 20th August, 2018," he said in the statement. "Mr. Samuel Ogundipe is also being investigated and prosecuted under other offences which violate Official Secret Act, Cyber Crime Act, and the Penal Code Law for which he has volunteered statements and is standing trial,"
At the protest ground, Mr Moshood argued that Nigeria's Freedom of Information law does not protect providing such information to the public. "Even the FOI Act limits access to classified information. The matter is already before the court and as a Nigerian he has the right to defend himself. But where a document that is classified goes out, we also have a duty to ask how it was leaked," Mr Moshood said while speaking to journalists and other protesters. "What has happened will be investigated and we will take appropriate action and you (the media) will be involved. The spokesperson claimed that the Inspector-General of Police, Ibrahim Idris, did not order Mr Ogundipe's arrest. "At all, the order didn't come from the IG. People should disabuse their minds that the IGP ordered for his arrest," the police spokesperson said. When asked why Mr Ogundipe was denied the opportunity of being represented by his lawyer, Mr Moshood, again, feigned ignorance, stating that he did not know the journalist was denied access to his lawyer. "Do you have his lawyer here? I am not aware that he was denied access to his lawyer and the court didn't know he is a journalist. "I was not the prosecutor, I was not the investigator but I will go and get the fact from them. If the lawyer was not informed, me I don't know. You're just telling me. "If his lawyer is here, he can follow me so that we can meet the investigator. Everybody taken to court has a right to a lawyer," he said. He said Mr Ogundipe's bank account was frozen "because it's part of the investigation process." One of the protesters, Deji Adeyanju, who spoke with PREMIUM TIMES, condemned detention of the journalist. "This is a deliberate attempt to frustrate Samuel and other journalists. This is not just bad for the image of the country, it is bad for the image of the police and it is bad for the image of this government. "Samuel Ogundipe is a Nigerian. He's one of us. If this can happen to Samuel, it can happen to any other journalist. "This whole idea of forcing a journalist to reveal his source by the police is wrong. The constitution is very clear. The court has ruled that the police or any other security agency cannot compel a journalist to reveal his source even if they want to torture him to a point of death," he said. The police asked Mr Ogundipe to disclose his source for a story, a demand that goes contrary to ethical journalism. On Wednesday, Mr Ogundipe was arraigned without access to a lawyer. The editor-in-chief of the newspaper, Musikilu Mojeed, and education reporter, Azeezat Adedigba, were also briefly held by the police on Tuesday; but were later released. Local and international groups, including Amnesty International, have slammed the federal government for attempting to intimidate and muzzle the press and asked Acting President Yemi Osinbajo to intervene.